Please consider adopting your next family member from the Humane Society of Chilton County (HSCC)! We have many wonderful animals and adopting them helps us save as many lives as we can. Plus, adopting from the shelter saves you hundreds of dollars over getting a "free" pet! Adoption includes spay or neuter, rabies shot, microchip, up to date on normal shots, bordetella shot, flea treament, and deworming. PLUS, you get a free vet visit with a Chilton County vet within 3 days of adoption. PLUS, when you adopt from the shelter, you also qualify for 30 days of free pet health insurance with 24 Pet Watch. You can fill out an online adoption application at this link. Lee is the past Director of the State of Alabama Emergency Management Agency under Governors Fob James and Don Siegelman. He served as a member of the Alabama Defense Security Council and Deputy Director of the Office of Homeland Security for Alabama. Lee founded the 911 organization and was elected to serve as the first state president. He currently is the owner of Lee Helms Associates (LHA), L. L. C., an emergency management/homeland security consulting firm in Clanton, Alabama. Lee served in the United States Air Force for six years. A long time supporter of the Chilton County Humane Society, Lee became its president in February 2018. Lee can be contacted on his cell at 205-351-1969. Tracie’s involvement with the shelter began in 2015 as a puppy and dog foster. She has been on the board since 2017. Tracie teaches school. Jeff has served on the board since 2017. He retired from the Alabama Power Company and currently owns Southern Dixie Auto Repair in Clanton. Jeff does a tremendous service to the humane society by being in charge of maintenance for the building and the shelter vehicle. Amy has been involved with the shelter as a volunteer and foster since 2014 and a Board Member since 2016. As an amateur photographer, Amy does a lot of the photo sessions for our special events as well as the pictures of our animals for adoption or rescue. The HSCC receives 250-400 animals a month. Some animals enter the shelter healthy, while others are abused, neglected, diseased or even critically injured. The policy of the HSCC is to euthanize ONLY those animals too sick to save or too aggressive to be adopted or rescued. As a result of this policy, there are many times the HSCC's capacity is full and must be closed to intakes until space is available. Adoptions and Rescues are vitally important to the pets of Chilton County. We want to find loving homes for all the animals entering our doors! The HSCC is a private charitable organization [501(c)(3)] totally dependent upon donations from local governments, businesses, citizens and the public. The Chilton County Commission and the Cities of Clanton, Jemison, Maplesville and Thorsby are asked to donate regularly. No drop off fee is charged to the citizens of Chilton County. The HSCC is actively raising money to build and equip a new facility. Our current building lacks heating, air conditioning, ventilation, space and equipment. Daily maintenance to the current facility takes away funds and personnel, both on which our pets' livelihood depend. Donations are greatly appreciated! Click the donate button on our home page. Contact us at 205-755-9170 if you would like to volunteer or donate in any way. HELP, we need you! Donate to help the Chilton County Humane Society! All donations stay local and help us care for the homeless animals of Chilton County and provide needed services to the community. Pet cremations are provided in a way that responds to the tenderness of your grief and the respect you have for your pet's life. 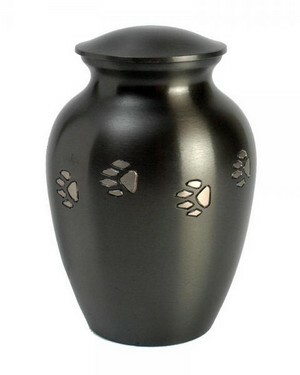 Your pet's ashes will be placed in a solid black urn; however, owners can furnish their own urn. Working with the Alabama Spay/Neuter Clinic in Birmingham, we are happy to offer Chilton County residents a low cost option for spay and neuter services. On the first Wednesday of each month, the Alabama Spay/Neuter "Snip It Express" transport truck will pick up pets in the shelter parking lot, take them to be fixed, and return them for owners' pick up the next day. To get your Snip It Ticket, just come by the shelter during our normal hours and purchase however many you need! Then just follow the instructions on the ticket to make your pet's reservation. Tickets can be purchased at the shelter or by calling the shelter at 755-9170 during opened hours. If you are making a donation or would like to contact us by mail, our address is P. O. Box 1716, Clanton, AL 35046. Office supplies -- pens, copy paper, file folders (manila and hanging), legal pads, sticky notes, manila envelopes, permanent markers (Sharpie), etc. Mops, brooms, dust pans, etc. For more items, or to order items online please visit our amazon wish list. Always shop Amazon by going to Amazon Smile and choosing the Humane Society of Chilton County, AL, Inc. for your charitable organization! Donate through PayPal by using the link on the upper left on this page.